Rooted in the first "penny press" of the 1830s, as well as in the sensationalist "yellow journalism" of the turn of the century, tabloid newspapers grew in popularity in the 1920s. The tabloid form was distinguished from standard newspapers, often called "broadsheets," by its smaller paper size, roughly 11 x 17 inches, and especially by its emphasis on large photographs and witty banner headlines. Tabloids appealed to mass audiences by favoring stories on crime, celebrities, sports, gossip, cartoons, and reader contests. The first and most successful tabloid in New York was the Daily News, which was established in 1919 as a venture of the Chicago Tribune by Joseph Medill Patterson, the cousin of the Tribune's publisher Robert R. McCormick. The first year's circulation was only around 26,000, but by 1920 the tabloid style had caught on, and the News printed two 20-page issues a day, selling 150,000 copies of each. 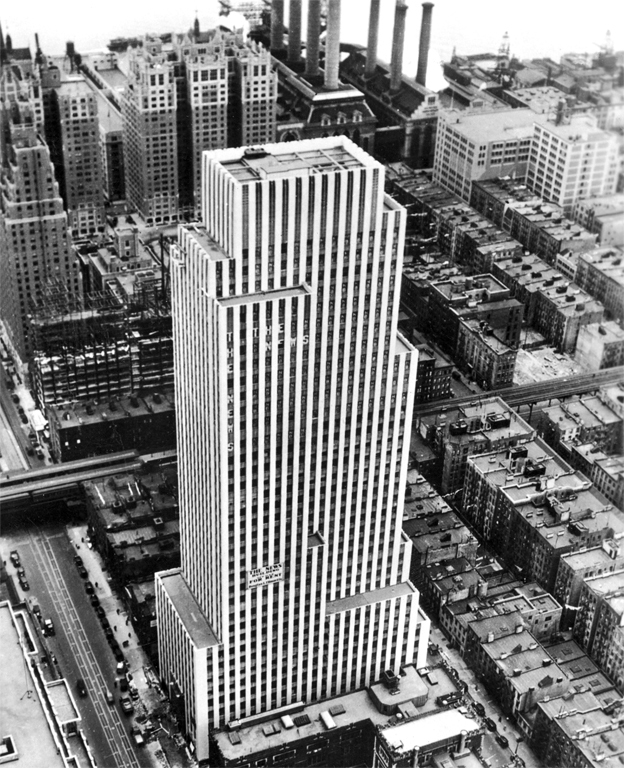 By 1930, when Patterson invested in the paper's striking skyscraper headquarters and printing plant, designed by the most celebrated of New York modernist architects, Raymond Hood, the Daily News was the largest-selling newspaper in the country, with a circulation of more than a million. The News Building is a 36-story tower located at 220 East 42nd Street with a nine-story printing plant on East 41st. Hood designed the fa�ade as bold stripes-bands of white brick piers alternating with windows with geometric patterned panels of reddish-brown and black brick. Hood minimized the setbacks, treating the form as a sheer tower rather than a series of stacked boxes. One critic observed, "The building has no middle and no top: the stripes simply jump off into space...and the setbacks are so few and so generous as to seem, like the top, to have been cut with scissors." Inside, the News, which touted itself in early advertisements as "New York's Picture Newspaper," organized its departments to make processing the photo-laden tabloid format easier-photographers and engravers were placed on the same floor as editors to speed up the paper's composition, and each photojournalist had his or her own darkroom.